We are a family of animal lovers, which can get us into trouble for sure. Right now we live in a tiny house (well duplex) with a teeny tiny yard (if you can even call it a yard). My kids would love to have a zoo in our house and well D and I agree we would also love that but it can't happen at the moment. What the kids can have are FurReal Friends! Have you seen things cute, cuddly animals that are interactive? The RurReal Friends come in all kinds of animals, cats, dogs, birds, farm animals and wildlife. There is a new line of FurReal Friends that are Newborn animals. This line includes birds, monkeys, farm animals and our new little friend the penguin! My son had the opportunity to make friends with Penguin and he is loving his new little friend. The Newborn penguin is cute as can be. He makes eating sounds, chattering and as P says he purrs when he is happy. This little guy will flap his wings and "ask" to be feed with his bottle that comes with him. When your child puts it in his mouth he will make gulping and chipping sounds. He moves his head and wings along with it. The kids really feel like they are caring for a real pet with the FurReal Friends! They even have a little bed they made out of a box for the new addition. We love them so much that P and A having been scouting them out when we are in the stores. I believe Santa will be getting a request or two for a new baby! This is a great way to add new pets without all the responsibilities of a real pet. Canadian Coupon Mom approved for sure! 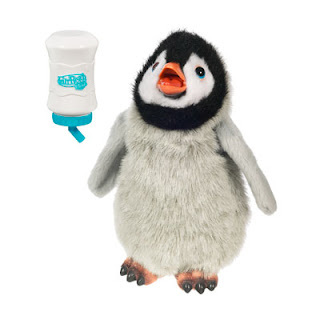 Where to buy: The Newborn Penguin can be bought on Toy's R Us Canada for $19.99 other FurReal Friends price are different.